I know, I know - not a new blog yet - that will come as I transition into Boston training early next year Any way, I have been continuing with the swimming and cycling along with a little bit of running. 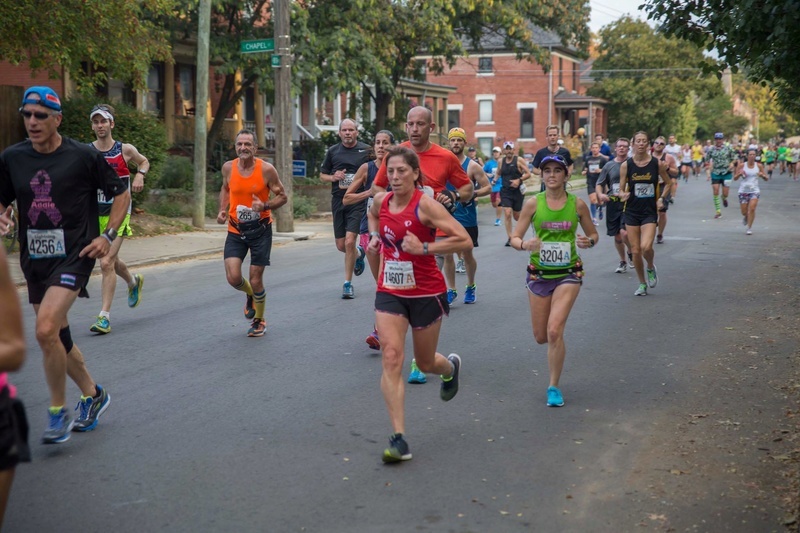 My focus was to "race" the Columbus Half Marathon (held yesterday) and although I didn't feel like I had run enough miles, I figured that I was still pretty fit so why not go for it. Originally I had thoughts of going for a sub 1:40 time, but not really believing in my mileage and with the slightly warmer weather than I would have loved (it was 61F with high humidity but it actually felt pretty good), I decided to go out a bit slower and just go with the flow. Ended up running a 1:43:01 good for 3rd place in my AG (which totally shocked me) and a slight negative split (even with a potty stop - you can see I was just going with it). I am incredibly pleased with the results and I felt good the entire 13.1 miles. Not sure I couldn't have gone faster, but sometimes when you are in the groove, you just go with it. So all in all, this blog started with my running of an excellent marathon in Columbus last October and it will officially end here with an excellent half marathon an October later. So are you going to try being fat-adapted for Boston or was the last one your one 'n only? Looking forward to following your Boston training and interested to see if another triathlon is in your future. @ounce wrote: Way to go, Miche1e! Good question, Doug and I'm not sure. I know that I will train the long runs that way. Got to get closed on our place in GA and get partially moved before I figure it all out. From what I gathered that you ran out of gas at Boston, I would say you were not deep enough in ketones. It takes a 8 weeks to get fully ketone dependent enough to run 10 miles. It's not something you can just train the long runs that way, IMO. Good luck on the close. Nice job on the podium finish! A good way to finish the year. Looking forward to you next blog. You are correct, Doug - just not sure that I have the will to make the effort and I think I'll go back to training with the UCan or Infinit products. These contain a starch and electrolyte mixture and the Infinit can even be tailored to you directly. I used a combination of UCan and Gatorade Endurance during the bike segment of my half iron and it worked like a champ. I drank/ate way more than I might have for a marathon and wow, it really helped. When I got to the run portion of the race (after 1.2 miles swimming and 56 miles on the bike), I felt great an energized. I didn't run out of fuel and/or energy until the very last mile of the run - and then I think it was more mental than physical as I could see/hear the finish line and just wanted to be done! Here is a photo from the race taken by our "group run" leader in Cleveland. Nice focused effort there, Michele! @Mark B wrote: Nice focused effort there, Michele! I rarely see A corral people from where I run. She is rather concentrated, though. Yes, I'll start posting here once again. Michele \"1L" Keane wrote: Recap of 2016. Wow...you had a busy and successful year and it looks like 2017 will be even more of the same. Two marathons and two half Ironmans! You really did catch the triathlon bug didn't you. Enjoy your new age group, stay healthy, and check in when you have time. We enjoy your contribution here. Yeah, you always have a seat around the fire. Mark's been using it to dry out his feet. Barefoot runners. Thanks for the recap. This past year was a good one for you! I can see how much fun you're having mixing it up with triathlons while remaining competitive as an AG runner. This year promises to be a lot of fun, too! Good luck! And yes, please post! It's fun to keep up with all you adventures.